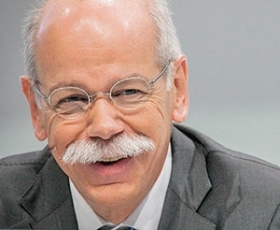 Dieter Zetsche: "We have the goal of designing security into the software." FRANKFURT (Reuters) -- Daimler CEO Dieter Zetsche said a desire to have better control over data security is one of the reasons Mercedes-Benz has joined a consortium of German automakers bidding for Nokia's high-definition mapping business. In a call to discuss second-quarter financial results, Zetsche was asked whether he was concerned about hacker attacks on Mercedes cars. "You can see from reading the papers that we are trying to acquire a platform together with our German competitors, to gain control over the platform which enables autonomous driving, for exactly these reasons," Zetsche said. "We have the goal of designing security into the software." Zetsche said the consortium, which consists of BMW, Audi and Mercedes, would seek to make the software available to third-party competitors if a bid for the Nokia business, HERE, is successful. Germany's premium carmakers are close to a deal to buy HERE for between 2.5 billion and 3 billion euros ($2.74 billion to $3.29 billion). But a final agreement hinges on the question of who owns the patents for the technology that helps self-driving cars talk to mobile networks, two sources familiar with the deal told Reuters on Tuesday. Earlier this week, a pair of veteran cybersecurity researchers showed they could use the Internet to turn off a car's engine as it drives, escalating the stakes in the debate about the safety of connected cars and trucks.